Few teams can match the heritage of the Montreal Canadiens. I would argue that, aside from perhaps the New York Yankees, the “Habs” (an oft’ used nickname for the team; short for “Les Habitants”) perhaps possess one of the most rich and recognizable heritages in North American sport. One need not be a Habs fan to admire the team – not only have they been one of the most successful franchises in terms of championships in North American professional sports, the have also been home to some of the most famous players in hockey history: Vezina, Morenz, Harvey, Richard, Plante, LaFleur, Dryden, Robinson, Roy…to name just a few. They are also a cultural touchstone, often uniting – though, sometimes, dividing – the city’s population. Given the team’s long and important history, it is perhaps strange that the a hall of fame is relatively new. This may be in part because the team moved buildings from the Forum (a beloved arena and a hockey shrine if there ever was one) to the Bell (nee: Molson) Centre in 1996 and that a hall of fame wasn’t a priority until recently. However, given the wonderful collection of artefacts, memorabilia, and team displays, I’m certainly glad that they opened this museum. It is an excellent team/corporate museum, nicely balancing between nostalgia, memory, history, and culture. Like most any team museum, the narratives don’t overtly dabble in politics, and their is very little in terms of dissonance (it is triumphalist, indeed – few mentions of some truly awful seasons over the past couple of decades). 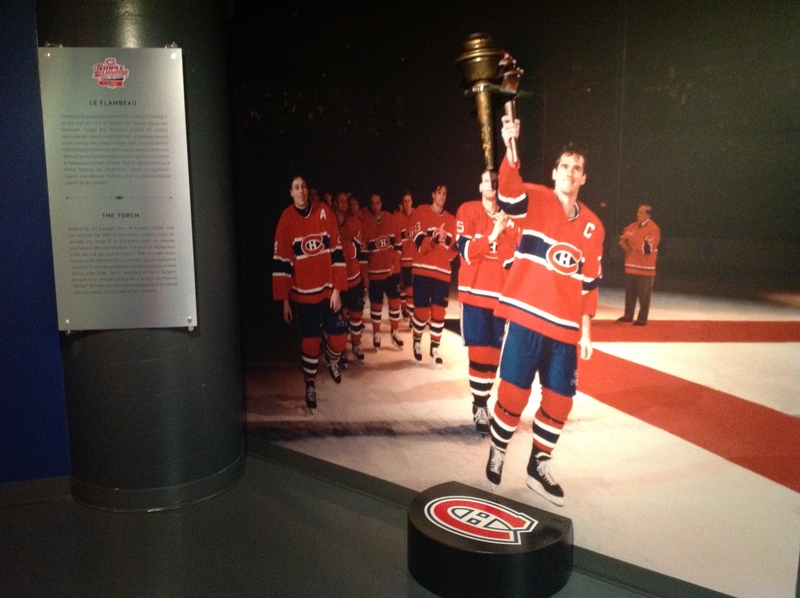 However, these are forgiven, as the sheer weight of importance of some of the artefacts make this museum rival – and often surpass – the Hockey Hall of Fame in Toronto. This is no mere team museum, my friends. Any hockey fan – heck, many sports fans – only need to see the Number 9 on the back to get a sense of awe and, for me at least, shivers. 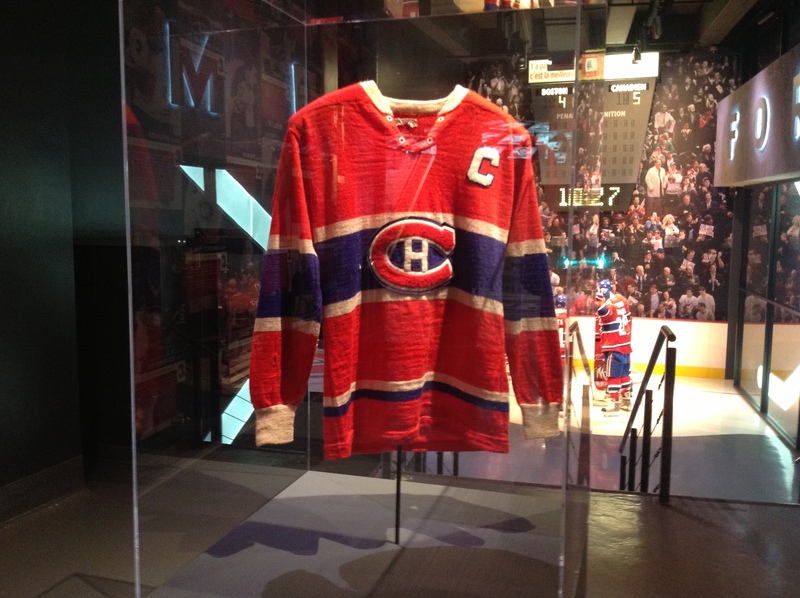 Indeed, the jersey (vestments is, perhaps, a better word) of Maurice “The Rocket” Richard – the most famous cultural symbol of the Montreal Canadiens – is the visitor’s first encounter. For those with the cultural capital to read and decode this text, this is gives the museum a sense of gravitas – there is important stuff in here. This is more than just hockey. Come, be close to these relics, and remember. Je me souviens, as it were. Subtle, political, and powerful. There are a few brave choices as well. 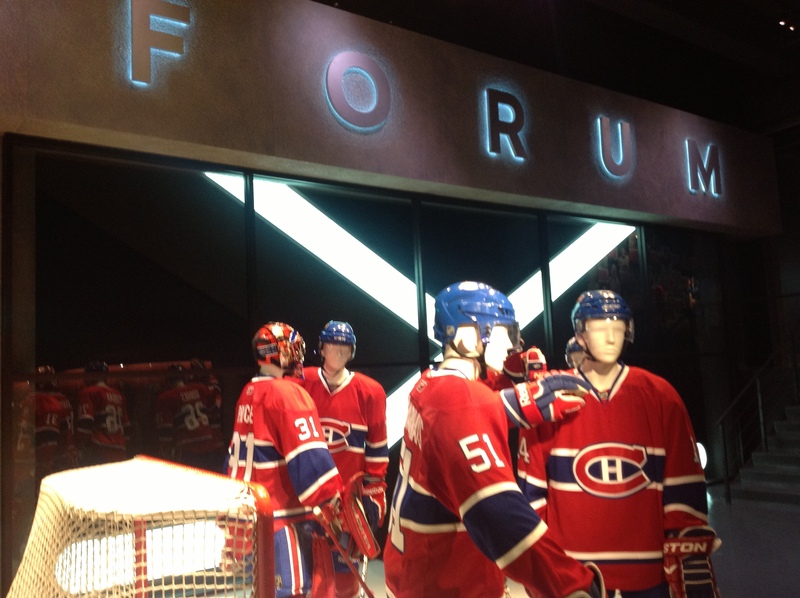 The visitor also encounters some very overt nostalgia with regards to the Forum which, in some ways, challenges the legitimacy of the Bell Centre as the home of the Habs. Perhaps enough time has passed and fans have settled into the idea of the new arena but, still, to have numerous displays to the old, beloved rink was surprising. 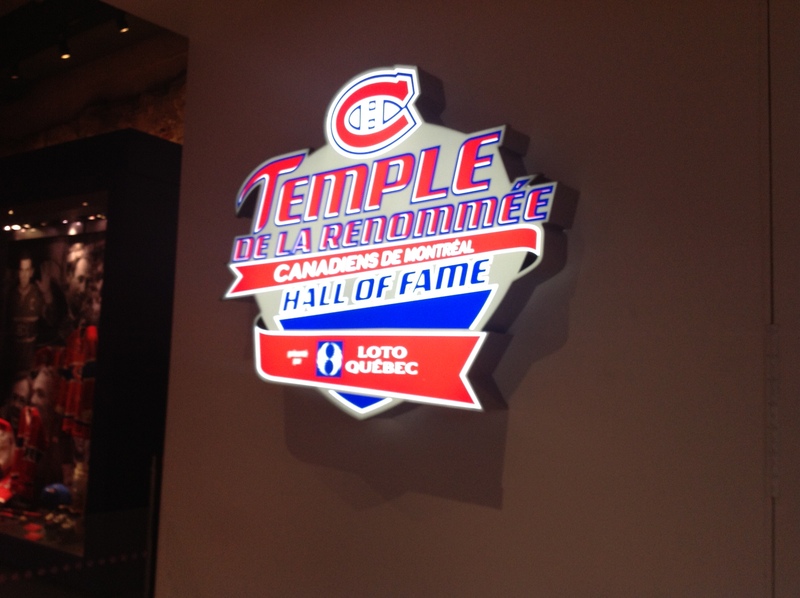 Of course, for a quasi-retired goaltender like me, a Canadiens museum is a point of pilgrimage. 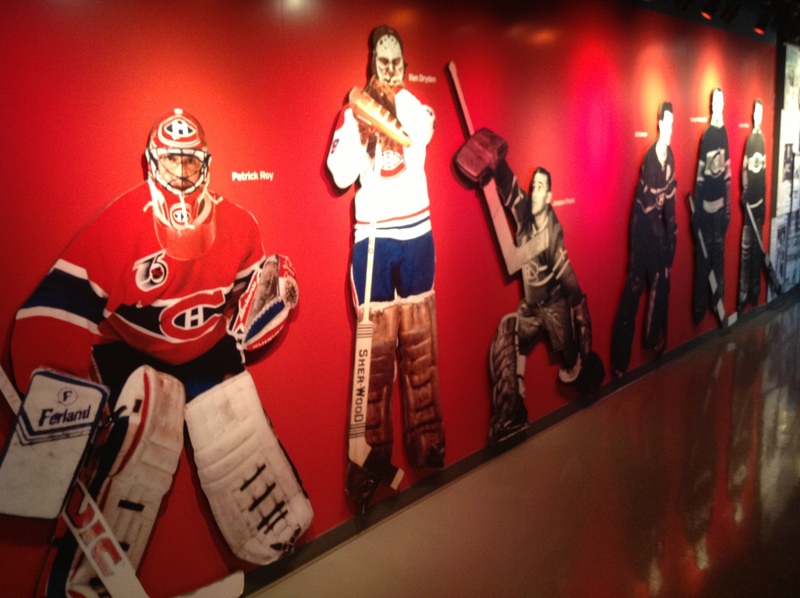 Simply put, some of the greatest goalies in hockey history were Habs. Again, there was an implicit trust that the museum narrative placed in the visitor. The museum knew it was important, and didn’t attempt to interpret the galleries for the non-supporter/non-fan. 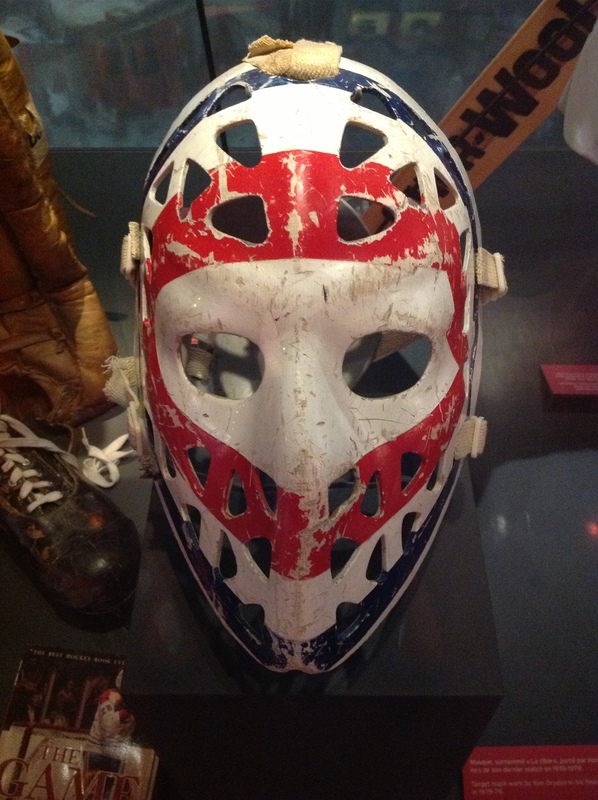 I am all for the “new museology” and dialogue and co-creation, etc, but it was nice to be able to see the mask of Ken Dryden, know about him, his accomplishments, his biography, his books, and be lost within my own acquired memories of him without an audio guide or intrusive interpretive panel dictating my connection to the artefact. Calling it spiritual might be a touch overboard, but it was something close to it. By Gregory Ramshaw in Uncategorized on October 9, 2013 .